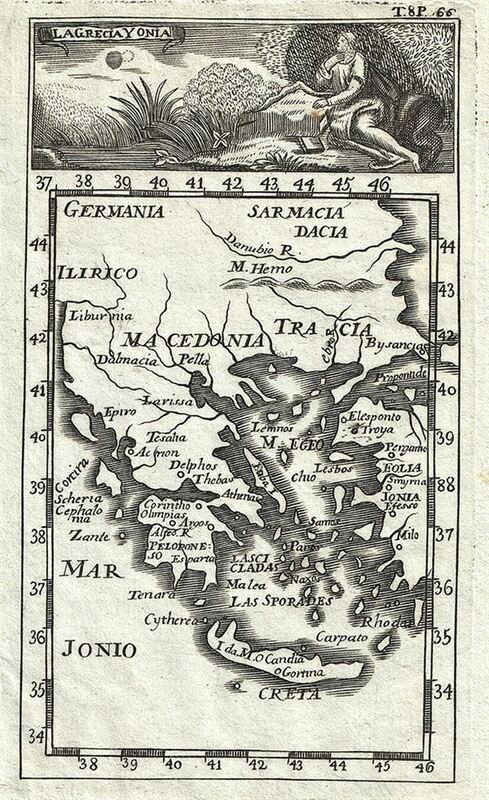 This is an appealing 1754 map of Greece and the Ionian Islands by Gabriel Ramirez. The map covers from Germania and Sarmatia to Crete and from Illyricum (in modern day Albania) east as far as the Sea of Marmara. The map identifies ancient Greek towns and regions, including Ionia in modern day Turkey. A beautiful illustration is included at the top of the map. This map was originally prepared in French by Abbot M. Pluche and translated into Castilian Spanish for publication in Volume VII, Part 4 of D. Gabriel Ramirez's Espectaculo de la Naturaleza, O Conversaciones a Cerca de Las Particularidades de la Historia Natural. Very good. Minor wear along original fold lines. Original platemarks visible. Narrow left margin. Blank on verso.